Here we are. The end of the road. 32 burgers eaten and evaluated (OK, a few more than that. But we just HAD to do some extra research in the later rounds, right?). There’s been full stomachs, arguing, winners, and losers. But overall, there’s been a ton of fantastic ground meat between two buns, with all sorts of delicious toppings in the middle. We’re ready to crown the winner of the inaugural Denver Burger Bracket, and we’ve got two burgers left standing: Park Burger vs. Highland Tap and Burger. We’ve literally said all that there is to say about each of the two burgers (No seriously. We’ve written 4 articles on EACH burger. ), so we’re gonna take you on a journey through our very own words this time, quote for quote. After that, you’ll have a chance to vote in our FINAL People’s Choice poll, where all of your favorites from past rounds will be included! The voting will end Thursday April 25th at Midnight, and on Friday we’ll announce both Our Winner and the People’s Choice Winner! Good luck, and may the best burger win! How do you choose between two great things? Unlike the NCAA March Madness tournament, these burgers can’t play the game for themselves to decide who wins (Although, who wouldn’t wanna see that happen???) So that’s where we come in. 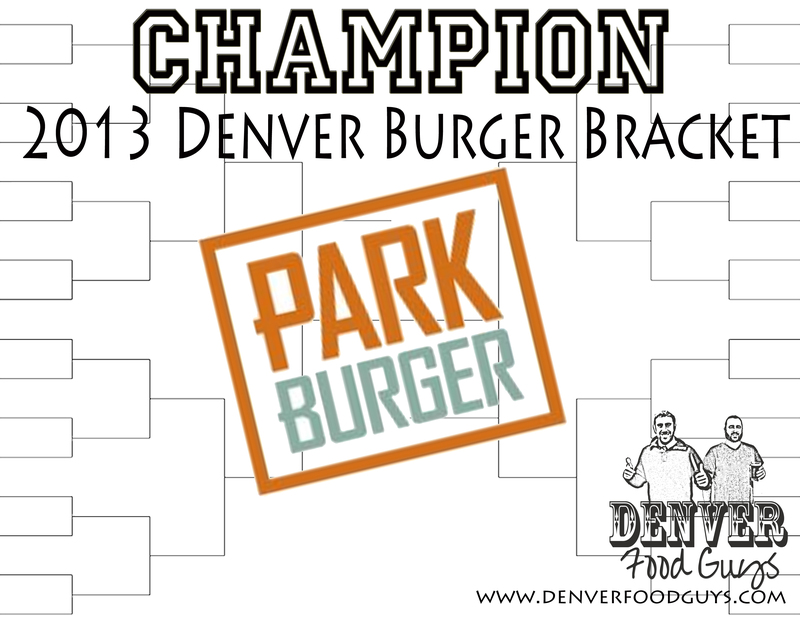 It’s up to us to decide the 2013 Denver Burger Bracket winner, and guess what? We’re up to the challenge. When looking at our own judging criteria, both Park Burger and Highland Tap and Burger score 10/10 in each of the categories (Taste, How is it cooked?, Bun/Bread, Toppings, and Price Worth-It-Ness). Virtually equal burger options. 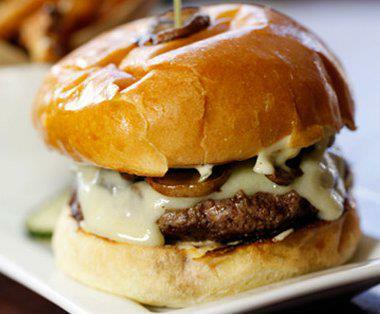 The buttery smoothness of the Shroom Luvas and the shear decadence of the Tap Burger at HTB, or the classic burger flavor and unique creations like the New Yorker or El Chilango burgers at Park Burger. 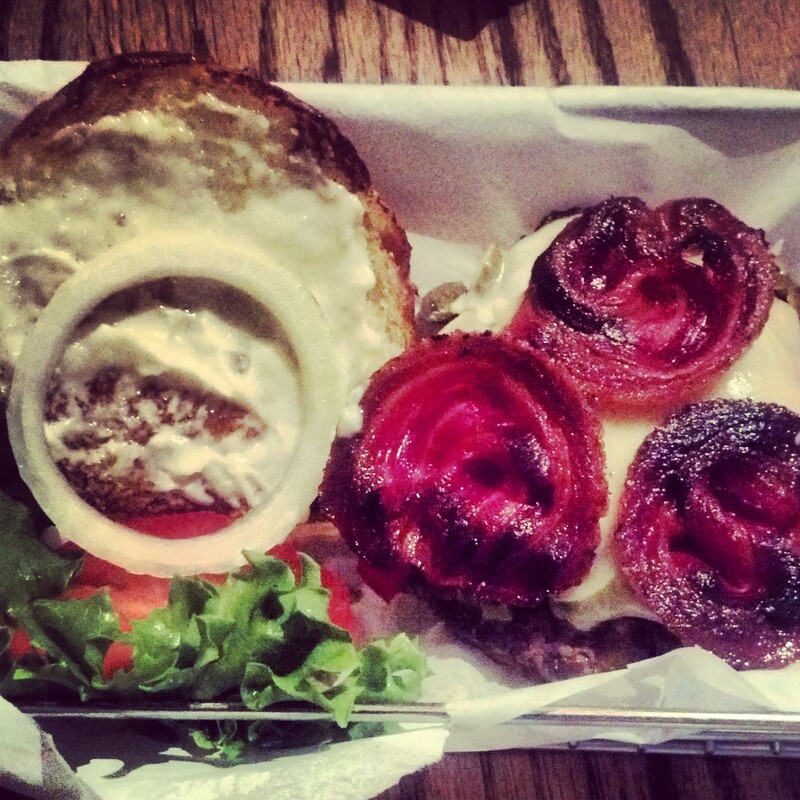 Go to either place on any given night, and you’re definitely leaving happy having eaten a delicious burger. So it’s gut-check time then. Literally, we checked our guts and listened to what they were telling us. When our stomachs rumbled for a juicy, meaty, and delicious burger, more often than not it was for one place. And actually, it was usually for one specific burger in particular. The Scarpone from Park Burger has everything that our guts crave in a burger. Saltiness from the pancetta, meatiness from the fresh burger patty, sweetness from the provolone cheese, tangy-ness from the giardiniera, crunchiness from both the pancetta and giardiniera, and even some umami flavors from the garlic truffle aioli. It’s the burger that not only won over our guts, but also beat out some very stiff competition. Congratulations to Highland Tap and Burger for winning our Denver Burger Bracket People’s Choice! We LOVE Park Burger’s burgers!!! We are heading to Denver in two weeks and cannot wait to get our burger fix at Park Burger! You gotta try the turkey burger, too!. Need I fail to mention those buns that tie it all together! Want one now!!! 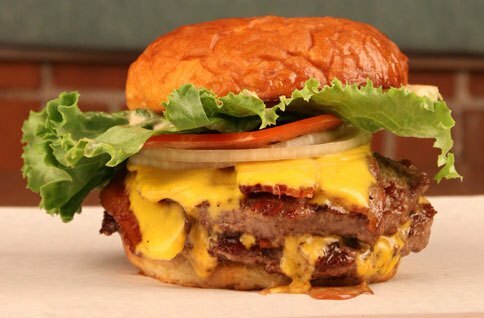 Highland Tap and Burger is the best tasting burger in the West!!!! We LOVE HTB!!!!!! We eat there every time we visit Colorado. It’s on our MUST visit list!!! YUUMMMMMMMY BURGERS!!!!! After reading that Highland tap and Burger won the Best of Westword Burger contest, I went with a friend to try it out. The burgers were okay, but we were appalled by our bill. My friend wanted a little more heat on his burger and he asked for some Tabasco. Not having Tabasco, our wait person brought him some Cholula which was fine until we received our bill on which we were charged $1.50 for what amounted to 5 drops of Cholula. I asked for arugala on my burger and was charged $1.00 for a small piece of it. Based upon these excessive charges and an only okay burger, we will stick to Park Burger, City Grille, or The Cherry Cricket. Love Parkburger. We are there almost once a week. Best veggie burger anywhere! I love ParkBurger! We went there for my friend’s birthday and had the best burgers and sweet potato fries I have ever had! Delicious!